Cookistry: Gadgets: Pot Clips - No, not that kind! 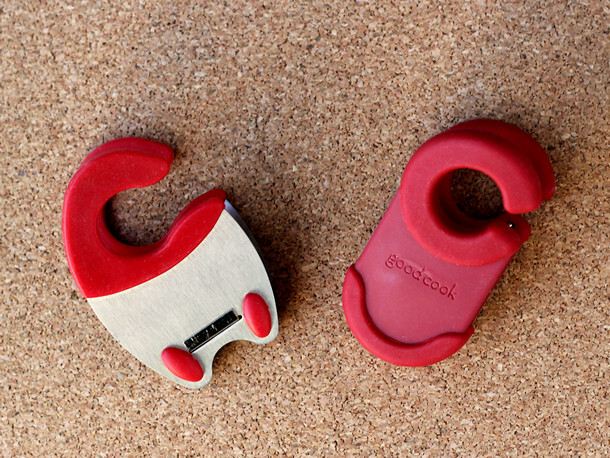 On a recent visit, I picked up a Utensil Pot Clip made by Good Cook ($4.99) because I'd been itching to try one out. Shortly after, Good Cook sent me another pot clip with a different design ($7.49) than the one I bought. Note: It wasn't sent specifically for review here. The point of the clip is to attach it to the rim of a pot, then use it to hold a spoon or spatula out of the hot pot. It makes a lot of sense. I have some spoons and spatulas that I can leave in a hot pot, but I have many with melt or burn marks on the handles from letting them rest on the rim of a hot pot or pan. Of course, the other choice is to put the spoon on the counter or on a spoon rest, but it makes more sense to just let the utensil hover over the pot where it's handy and not making a mess. It's also useful when I've got multiple pots cooking, so each spoon stays with its own pot. So, since I had competing versions of the same concept, I thought a bit of comparison was in order. The first clip is made from metal with silicone grips. The spring-grip function is achieved by means of bent metal. The new clip is made from hard plastic and silcone, and has a metal spring mechanism. 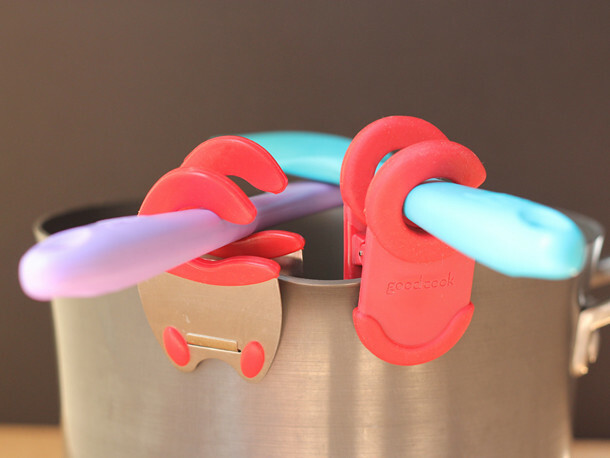 On first glance, the larger opening on the first clip seemed like it would be more useful for a wider variety of handle sizes, but in reality, the bendiness of the second clip allowed it to grasp pretty much every spoon and spatula I normally use. The wider opening on the first clip made it slightly easier to get a spoon in there, but the smaller hole on the second clip grabbed the utensil a little more securely. The major difference between the two clips was that the first clip tends to angle outwards from the pot it is secured to, while the second remains slightly more upright. This slight difference means that in order to keep a spoon angled with the stirring end down (to keep drips from traveling towards the handle) you need the clip needs to grab farther up the handle with the first clip. None of the differences between the clips are dealbreakers - I've been using both clips - but I do like the design of the second one better, and it feels sturdier, as well. This was previously published on Serious Eats.